The University of Ulster Sports Union has celebrated a year of sporting success at its annual Colours Sports Awards at the Hilton Hotel in Belfast. Awards were handed out for the achievements of the past sporting year, recognising the role sport plays in University life. The Ulster Elks Men’s Basketball team picked up the overall team of the year award as well as the team of the year trophy for the Jordanstown campus. The club has had an successful year retaining the Irish Colleges League Northern Conference for the fourth year in a row and winning the Irish Colleges final for the third time in four years. David Flynn, Sports Union President, said that the achievements of the student athletes are a testament to their dedication that keeps sport alive at the University and sets an example for all students. 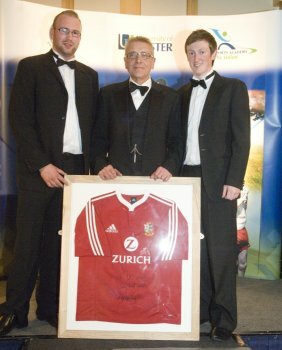 Athlete Tom Reynolds won the prestigious Silver Salver, awarded to the sportsperson of the year. Tom is a decathlete and is a member of the Athletics club at Jordanstown. He was part of the of the Northern Ireland Commonwealth Games squad which travelled to India in 2010. At the Irish Outdoor Intervarsity competition Tom won the combined event and 110m hurdles setting new University of Ulster records. At the Indoor Intervarsity he won the combined event setting a new Irish Universities Athletics Association record. The North Down AC member is a strong contender for being picked on the Irish team for World University Games later this year in China. 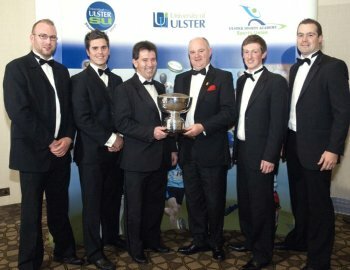 The Jordanstown Men’s Gaelic Football team scooped club of the year award. In an impressive season, the club has reached no fewer than five All-Ireland finals and two Ulster finals this year. One of the biggest clubs at the University, every team at every grade throughout the club reached their respective All-Ireland Final. Chris Gill picked up the coach of the year award for his dedicated coaching of the Fencing Club at Coleraine. Chris has been coaching at the Coleraine campus for the past 18 years and he continues to put a huge amount of hard work into improving the club and increasing their membership. He is also the president of the Northern Ireland Fencing Association. The Jordanstown Mountaineering club also picked up a merit award and the club’s Patrick Poland was awarded administrator of the year on the Jordanstown campus. Coleraine student Easkey Britton won the coveted President’s Plate, awarded to sportsperson of the year for Coleraine and Magee campuses. The Donegal native won her third intervarsity title in a row this year. She has won the first three Irish Championship Tour events this year which has propelled her to her fifth national title. Easkey has also qualified for the European championships which will be taking place in the Autumn. She was also nominated for the Billabong XXL surf awards in the girl’s performance category. These awards – dubbed the Oscars of surfing – were held in California only a few weeks ago. She was the only European surfer nominated and came second. Coleraine Women’s Volleyball Team picked up the prestigious Hurst Trophy and was named team of the year for the Coleraine and Magee campuses. The club only got back up and running this year and entered the NIVA’s first division in which they only lost one game and secured promotion to the Women’s National League where they will compete next year.